We’re on a bit of a Lew & Huey streak here, coveringquite a few of their watches. We’ve also been fortunate to be in a unique position with the brand, being able to spend time with prototypes (and, eventually, the production version) of their watches. Given that, we’re able to give you a hands-on take on their latest project – the Lew & Huey Cerberus. Interestingly enough, for a watch named after a mythical three-headed dog, we got to spend time with three prototype variants of the model. As they were prototypes, there are of course some details that are being tightened up for production (fit and finish, alignments, etc), and were fully noted ahead of our receipt. Interestingly, one change that is being made to the production model will see the exhibition caseback of our samples swapped out for a solid caseback. While some might lament that loss of visibility, it is more in keeping with the versatility and robustness they’re going for in the design. Speaking of design, this is one that has some unmistakable Lew & Huey cues – but you can’t also help but to see some other vintage inspirations creeping in there. 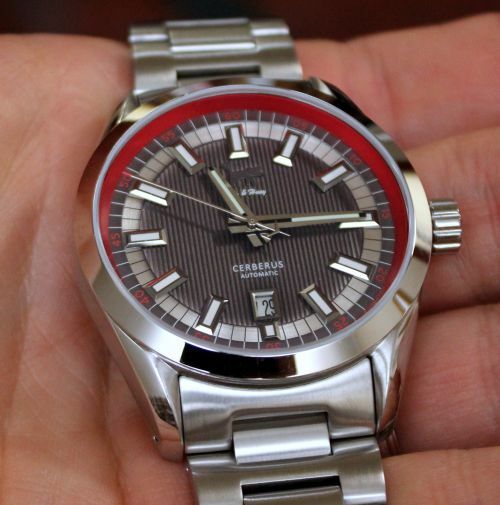 In a discussion with the owner of the brand, Chris Vail, he disclosed that the primary inspiration for the Cerberus comes from the Omega AT, as they were going for an executive sport watch. Some of this shows up in the dial (vertical pattern like the AT). 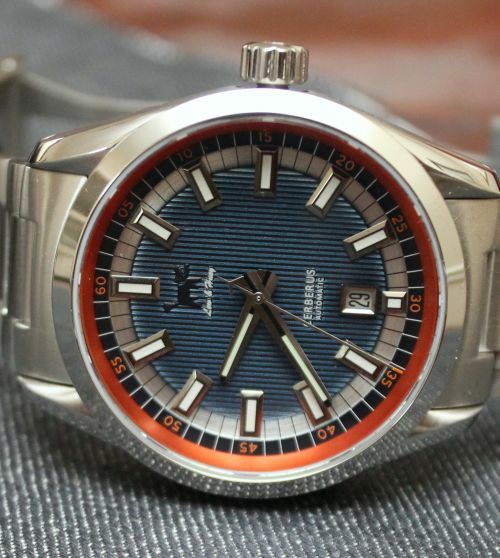 Among the other watches in the mix for inspiration you’ve got the Rolex Milgauss. This particularly shows up when you tilt the watch at an angle – the colored internal bezel gives the crystal a hue, not unlike the tinted crystals the Milgauss has. That crystal is a dome, but it’s a very shallow dome (in fact, I had to double-check with Vail to ensure what I was seeing). With this type of crystal, you get the wider viewing angles of a flat crystal, but still get some of that interesting distortion at extreme angles. When you are looking at it straight on, though, you get a great view of the very dimensional applied markers, ridged dial, and a handset that picks up those dial ridges as well. 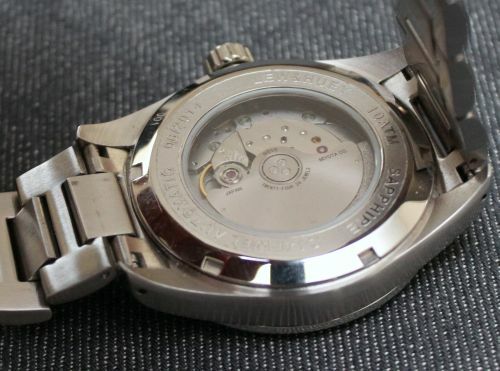 You’ll also see that the numerals around the outer track pick up the color of the internal bezel, lending another bit of unity to the design. Jumping out to the case, you’ve got the alternating brushed and polished finishes that I rather like, especially on something that’s intended to be a more upmarket sort of a sport watch. I do wish that the bezel was brushed (rather than polished) just to keep the smudging down, but I’ve a feeling that’s more of a personal preference. There was also something I couldn’t quite put my finger on with the solid end-link on the bracelet. For some reason, it just felt a touch off in the transition from the case to the bracelet. The case lugs themselves have some angles to them to graduate things down to the bracelet, which certainly would help in the transition. For some reason, though, it just gnawed at me a bit. I had a discussion around this with Vail, but I couldn’t (and still can’t) pinpoint what exactly my eye is picking up on. I know that’s not particularly useful information from me, but I thought I’d put it out there – perhaps a reader can put some words to it, and we can then provide that feedback to the brand. Past those two bits (the polishing and the end links) this was a fun watch to wear. 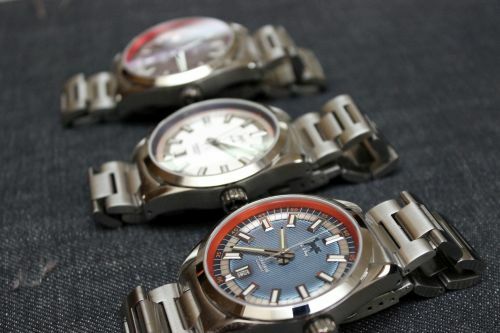 I really anticipated being partial to the white/silver dial, but it was the blue and orange combo that won me over, and saw the time on my wrist (the third color combo, black and red, I took to calling the A-Team variant). 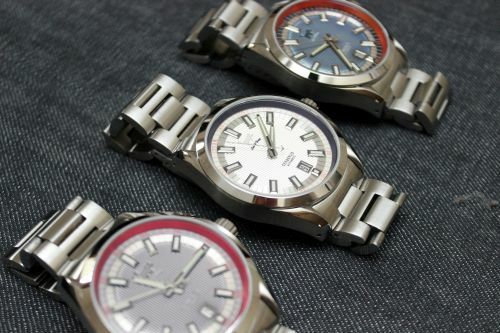 Whatever the color choice, it’s a watch that fits nicely to the wrist. 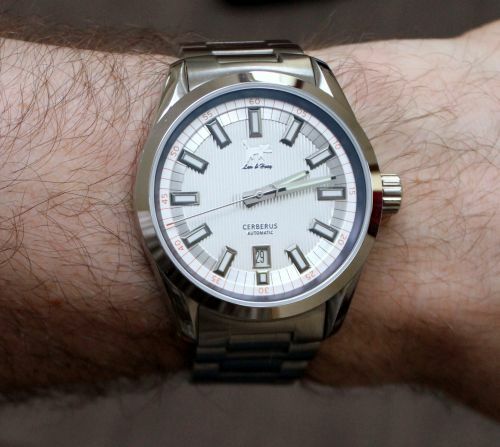 The stainless steel case is 42mm, so it’s a good size. Though the 50mm lug-to-lug saw it standing off of my wrist some (they have a fairly shallow curve) it was still a pleasant fit, and I didn’t feel like it was flopping around loosely. Finally, with a case height of 12mm (helped along by that shallow crystal), this is an automatic that should fit under just about any shirt cuff you may have. 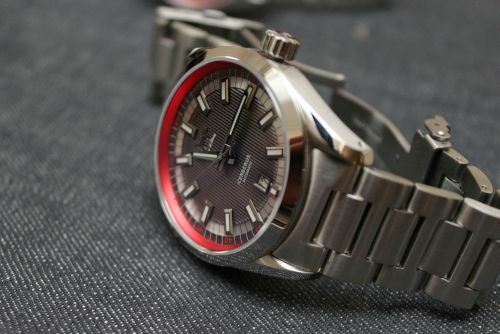 With the Miyota 9015 beating, you’re not going to have any worries about the reliability and accuracy either – plus, your local watch shop should be able to maintain and service the movement, should the need arise. So, what do you need to plunk down on the barrel to pick one of these up? The Lew & Huey Cerberus is expected to retail for $699.99 – but if you get in on the preorder (with delivery anticipated in late July), you can snag a very nice discount, and get it for only $500 by using discount code WWR. If that’s enticing to you, you’ll want to move quickly – the pre-order is anticipated to close by July 4th. Thanks for the great review, Patrick! 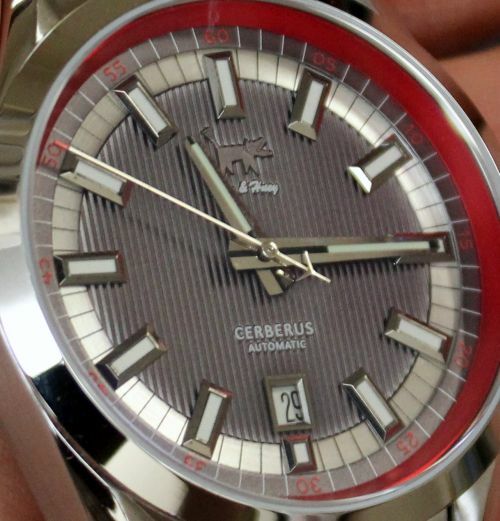 We actually just raised the pre-order price to $525, since we’ll be delivering the Cerberus in July, but Wrist Watch Review readers can get $25 off any Lew & Huey model reviewed here (so far, the Acionna and Cerberus) by using coupon code WWR at checkout. This watch looks really awkward especially with the logo and color scheme. 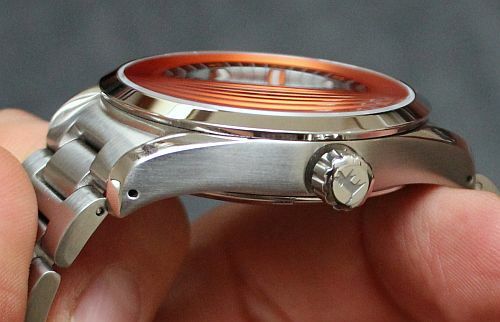 Is this watch trying to be refined and classy? Or is this watch trying to be loose and casual? Not really my cup of tea especially the weird looking logo and font.